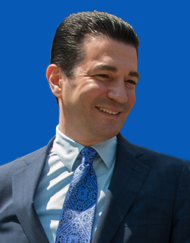 Gottlieb was scheduled for a Sept. 29 Luncheon, which had to be postponed. As a result of the impact of Hurricane Maria on Puerto Rico and the large number of pharmaceutical and medical device manufacturing facilities on the island he had to travel to Puerto Rico on the original date of his Headliners Luncheon to meet with industry executives and government officials to assess the impact the hurricane had on the U.S. drug supply. addressing the chronic staff shortage.